Chamomile has been used for centuries as a healing herb, both internally and externally. 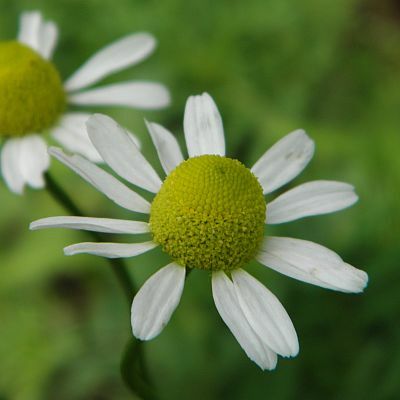 Chamomile (Chamomilla recutita) is a great herb to have on hand in an all natural first aid kit. Chamomile grows all around the world. It is sown by seed in spring. The flower heads are picked in summer and then dried. Once dry, be sure to keep the dried herb out of direct light. A paper bag works well for this or a even a glass container if there is no moisture present. Place them in a dark, dry cupboard. Chamomile is an herbal nervine. A nervine is a relaxant that can help to relax frazzled nerves. Taken as a tea, chamomile can help to calm you. It can also be drank by children who are a little nervous. When chamomile is taken at bedtime, it can help soothe you into a gentle nights sleep. Children can also benefit having a cup of tea at bedtime to help them relax from the day. Drinking Chamomile tea also works as an antispasmodic on the belly. An antispasmodic helps stop or reduce spasms. Chamomile has been taken for digestive problems since the 1st century A.D. It is gentle and is very suitable for children. It is used for indigestion, bloating, colic, and acidity. Taking a cup of chamomile tea can help settle an upset tummy in both adults and children. It calms and soothes the stomach lining in a short time. A cup of chamomile tea can also help ease tense muscles, and is used during by herbalists for patients with menstrual pain. Externally, Chamomile, is also very useful to our bodies. An infusion of chamomile flower can be added to your bath to help with rashy or itchy skin. Chamomile can help calm skin irritation from eczema. A cream or ointment infused with Chamomile is also wonderful for your skin. It helps to heal many rashes, reduce skin inflammation, and your skin would receive the benefits of both the Chamomile as well as the oils and butters used to make the cream. Chamomile can be used as an eye wash. Take the infusion (tea) and add just a little water to dilute it. Place a cotton ball into the diluted tea. Squeeze out so it is not dripping and place over a closed eye. A chamomile tea bag will help to reduce puffiness, and can help when your eyes are tired. It can also be used for styes and other eye irritations. Just clean area with diluted tea.Be cautious not to get too much into the eye itself. One fresh flower has the equivalent healing properties to one tea bag of the herb of packaged tea. If you have never had chamomile tea from bulk herb before, than you’ve never really had chamomile tea. The tea bags that you get from most companies don’t have nearly the taste that you get from a bulk tea. 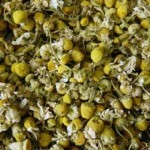 You can buy bulk chamomile in most health food stores as well as online. Heat water to just under the boiling stage. Place the herb into a cup. Pour the water over the herb. Let steep for about 10 minutes. Strain into another cup. Add sweetener, and enjoy! You can also use a tea press, or other tea infuser to make a cup of herbal tea. It is very easy and simple to make your own chamomile oil at home. This is an infused oil, not to be confused with an essential oil. First, you will add the dried Chamomile to the mason or canning jar. Pour the oil over the herb until all the herb is covered. Shake it just a bit to make sure herb is covered. Next, cover the jar and put in a sunny window. Allow the herb to steep in the oil for 8 weeks. At the end of 8 weeks, the oil now has the herbal medicinal properties of the chamomile. Strain by using a cheesecloth. Put the strained oil into a dark glass jar. An amber, blue or green works well. The dark jar helps to keep the light out. Add a few drops of lavender essential oil. Use about 2-3 drops per one ounce of oil. The fresh plant can cause dermatitis in sensitive individuals. Do not use if allergic to daisies. Can cause reaction in persons allergic to daisies. Chamomile may reduce the absorption of drugs taken orally. Chamomile also may increase the effects of anticoagulants and sedatives (including alcohol). If taken in large doses, it can decrease the absorption of iron. Should not be taken by people who are on blood thinning medication like Coumadin.